Greenwich News: September 9, 1910. Page 3. Comrade Silas E. Mead was elected the president of the Tenth Regiment, Connecticut Volunteers, at the annual reunion of the veterans at Savin Rock last Thursday. 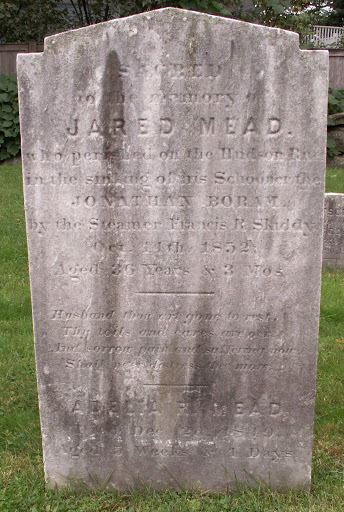 President Mead was a member of Company I, in which many Greenwich men enlisted. 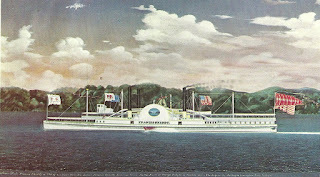 He has always been prominent in Lombard Post, G.A.R., activities, serving for many years as the commander of the Post. The Tenth is to be congratulated upon its fine selection for its commanding officer and president. The business meeting was the first thing disposed of at the reunion, after the general handshaking and inquiries about one another. The report of the secretary and treasurer, William E. Whittlesey, was most encouraging, for the regiment is in splendid condition financially. The death roll revealed the fact that nine men had gone from the ranks the past year. After the election of officers the veterans were entertained by Miss Rena Teresa Barnes, one of the daughters of the regiment, whose sweet voice has been heard on Memorial day in Greenwich. There was also a recitation by Mrs. Paul and an address by William Allcorn. 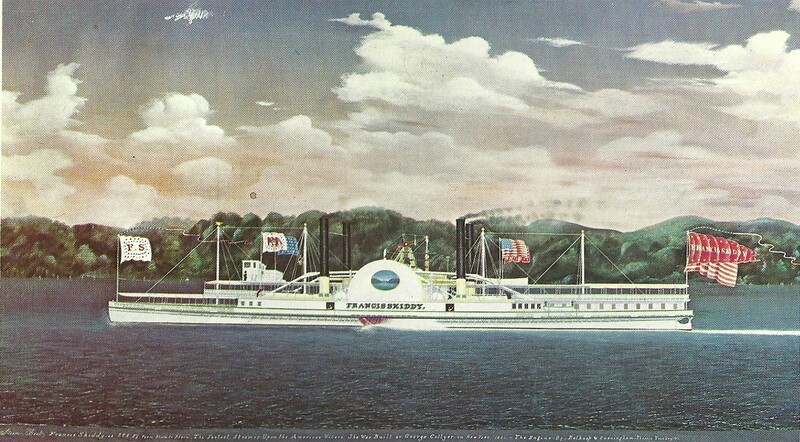 When the business session, which was held at the Maple Palace, closed, the veterans and their friends adjourned to Wilcoxs, where a shore dinner was served. About 125 people enjoyed the dinner and the speeches. The newly elected president, Mr. Mead, was called up upon and made a few remarks. Then followed other speeches, recitations and the singing of "America" at the close. Greenwich News: Friday, June 10, 1910. Page 7, column 5. Mrs. Caroline Mills Mead, widow of the late William H. Mead, died at the home of her niece, Mrs. Henry V. Peck at Relay place, Cos cob, least Friday after an illness whose duration was nearly a year, aged eighty-four years and six months. The funeral was held at the home of Mrs. Peck on Tuesday, Rev. M. George Thompson officiating. The service was an impressive one. Hymns were sung by a quartet consisting of Dr. and Mrs. Carl E. Martin, Arthur H. Dorland and Miss Lillian Reese. 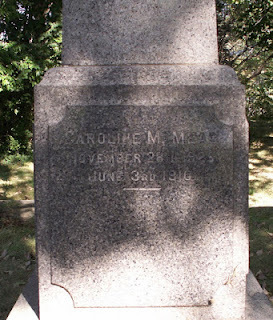 Mrs. Mead was a prominent woman in Greenwich, a woman of strong character and mind and one highly respected in town. 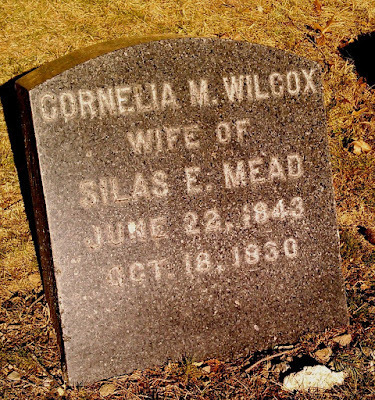 She was born in 1826 in Stamford, the daughter of Ebenezer and Rhoda Smith. On her marriage to Mr. Mead she came to Greenwich to live in the old homestead which is now occupied by Mr. Young. Thirty-seven years ago her husband died and upon her then devolved the task of looking out after his large land holdings. In recent years she has done much to improve the property. She had four streets laid out, Mead circle, Suburban avenue, Glendale street and Randolph place, all of which are well built up. 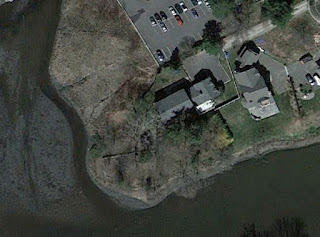 She showed remarkable business ability in all of her dealings, and did much to build up Cos Cob. 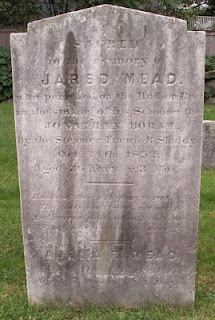 Mrs. Mead was one of the oldest members of Christ church and was active in church work. She was a member of the New Canaan Chapter of the D.A.R. She leaves two nieces, Mrs. Peck and Miss Caroline Smith, and a nephew, Benjamin Smith, besides grandnephews and grand nieces. Solomon Mead, when asked his occupation stated that he was a farmer. His ninety years of life in Greenwich indicate that his outdoor occupations and his love for nature of which he was so observant were conducive to a long life; while his accumulation of a million dollars, indicates that he was a careful, shrewd financier. He was only fifteen years old when his mother, Hannah Mead, whose praises he was always sounding, bought of Ruben Holmes-the farmer, showmaker, school teacher- thirty-two acres of the tract under discussion last week. 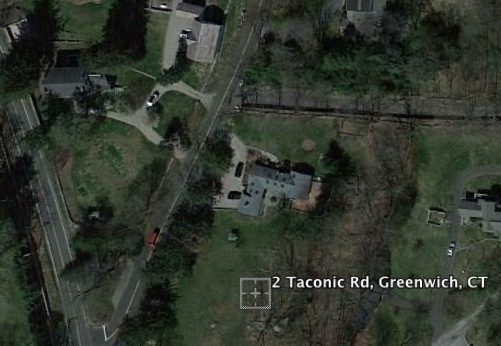 This parcel included land now owned by the Parmelee J. McFadden estate and the site of the old Titus Mead homestead where Timothy Knapp met his tragic death. He has the trait also of secretion and long after his mother's death he was adding to the original farm. He made many improvements upon the property. The blind ditches he laid our for drainage purposes still remain to ____ his skillful, scientific handling of the property. Finally, the Solomon Mead possessions extended south to the Post Road and west to Maple avenue. But the memory of the old potato cellar is bond to recur to every Academy scholar who in those bygone days imagined that it was a robber's cave and gathered there with his playmates while scheming for mischief. 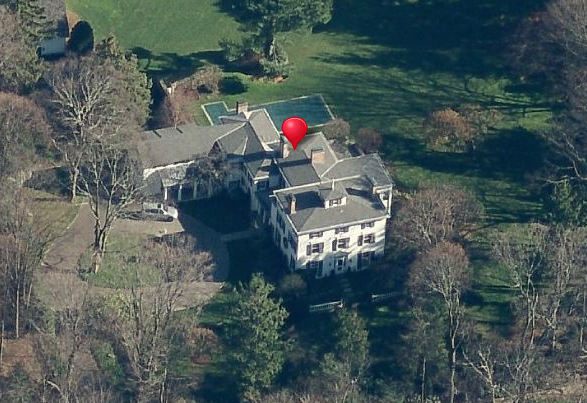 Probably in the entire career of Solomon Mead nothing interested him more than the construction of the stone house on Maple avenue still in the possession of members of his family. The old farm house from which every field of the one hundred and fifty acres was visible wood just inside the south entrance to the present house. 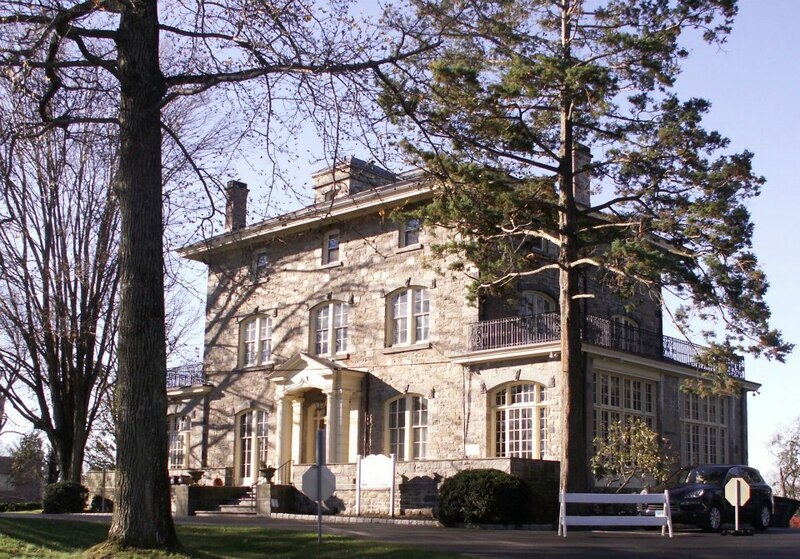 Possibly Henry Bush built it for in the spring of 1755 he sold it to Samuel Seymour and it remained in the family till 1830 when Solomon Mead bought it with eight acres of land. When the Saunterer first saw it, it had a comfortable "sit down" appearance characteristic of all the old gray shingle, low-studded sweep backs of that period of construction. Near the north end was the well house in which an empty bucket hung over the curb. Under its small front windows, that looked out of the porchless house, bunches of phlox and marigold nodded in the summer breeze. It was overshadowed by the great stone house, then just completed and it was only a short time after that the family moved into the new house and the old one disappeared. Greenwich News: September 2, 1910. A history of the town of Greenwich is now being compiled by Spencer P. Mead, L.L.B., author of the History and Genealogy of the Mead Family, who expects to have the book ready for publication next year. Among some of the interesting features of the work is a graphic account of the Battle of Strickland Plains, which took place during the winter of February, 1664, in which a party of English and Dutch soldiers surrounded an Indian village at Cos cob, burned the village and killed to cover reports, over seven hundred Indians. The account of the Revolutionary war includes many interesting incidents regarding the inhabitants of the Town of Greenwich, which heretofore have never been published, as also a list of the soldiers who serviced during that war. Genealogical notes of the early families are to be included, and among the names will be found Adams, Avery, Banks, Betts, Brown, Brundage, Brush, Bush, Close, Davis, Dayton, Denton, Ferris, Finch, Greene, Hendrie, Hobby, Holly, Holmes, Howe, Hubbard, Husted, Ingersoll, Knapp, Lockwood, Lyon, Marshall, Mead, Merritt, Mills, Palmer, Peck, Purdy, Reynolds, Ritch, Rundell, Sackett, Seymour, Sherwood, Smith, Studwell, Sutherland, Sutton, Waring, White, Wilson, and Worden. A complication of diseases, the result of old age, caused the death on Wednesday afternoon of Silas E. Mead at his home, 124 Putnam avenue, in the 73rd year of his age. The death of Mr. Mead removes from the community one of its best known and most prominent citizens, one who was born and lived here for practically his entire life and a man who has held many positions of public trust. While those intimate with Mr. Mead have realized for some time that his health was such that recovery was unlikely, the news of his death came as a shock to his many acquaintances. Mr. Mead had a wide acquaintance in Greenwich and he was loved and respected for his upright and honorable administration of affairs, both in his private life sand while a servant of the public in positions of trust which he held during his long and useful career. he knew Greenwich as few men have known it, and when he became reminiscent many interesting bits of early local history were enjoyed by those who were fortunate in hearing him. 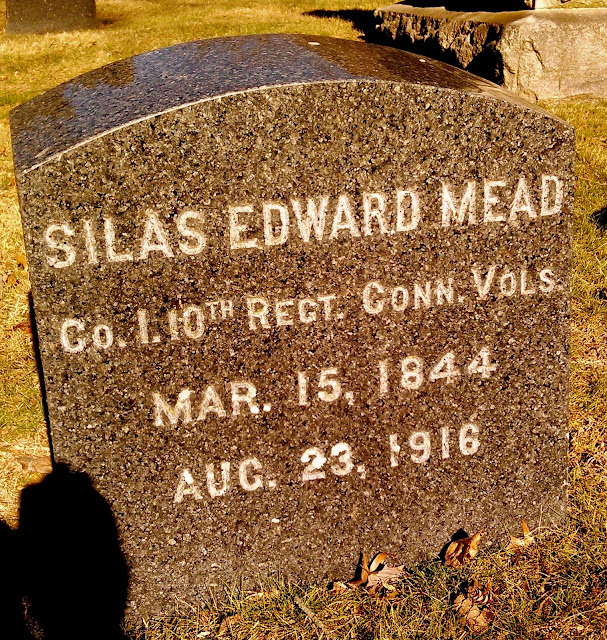 Silas E. Mead was born on March 15, 1844, in the old Clapboard Ridge school district and he received a common school education during the early years of his life here. A son of Silas D. Mead and Althea Close he was a descendant of one of the oldest families in the country, the Mead's having been among the original colonists. 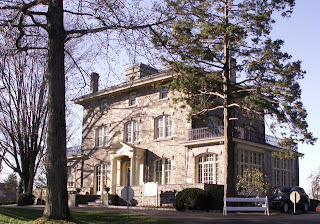 Later, Mr. Mead received a course of training at North Greenwich Academy after which he lived as a farmer until August 14, 1862, when he enlisted in the First Connecticut regiment, 10th Co. C. V. I. in the Civil War. He was a deacon in the North Greenwich Congregational church and an active member all his life. He served on the Greenwich school committee for years and also the board of assessors and board of burgesses. The funeral will be held from his late home Saturday at 3 P.M. and Rev. Levi Rogers will officiate. Interment will be at Putnam cemetery. Greenwich News: Friday, July 8, 1910. Page 2. A very pretty altho quiet wedding was that of Miss Ida Gertrude Mead, oldest daughter of Mrs. Gilbert O. Mead of Round Hill, to Allen H. Brown of Colchester, at the bride's hem Wednesday afternoon, June 29. The bride wore a pretty tho simple white gown of elk batiste. Miss Fannie L. Mead, sister of the bride, was bridesmaid and Gilbert E. Mead, brother of the bride, was best man. After the ceremony a very nice wedding dinner was served by the bride's mother. Mr. and Mrs. Brown received several beautiful presents, among them was a handsome clock and a set of silver spoons from the Round Hill M.E. Sunday school of which she was organist for several years. She will be greatly missed in the church as well as in her home. Mr. and Mrs. Brown have the best wishes from a host of friends who wish them success and a long and happy life. Mr. and Mrs. Brown will take up housekeeping in Long Ridge.